Joan never imagined that a walk through the Upper East Side would lead her to The Wild Bird Fund with a pair of birds in tow. While taking a walk on January 17, after winter once again graced the city with a snow storm, she spotted two robins huddled together on a snow bank at East 73rd and Third Avenue. “They were puffed up, hypo-thermic and totally still. I picked them both up without a fight,” Joan said. Joan brought the robins to The Wild Bird Fund where examinations and radiographs revealed that the male robin had a humeral fracture of the wing, preventing him from flying. The female robin, however, was perfectly fine. She was simply staying with her mate. We also suspect that she was bringing food to him as neither robin was starving when they came in. 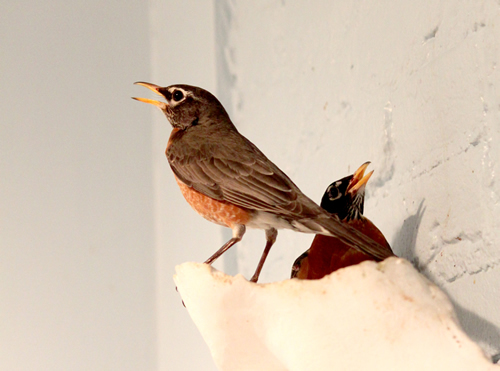 After arriving at The Wild Bird Fund, the male robin’s wing healed and he began flying again. The couple stayed at The Wild Bird Fund until the male robin was deemed “flying fit,” all the while enjoying romantic meals of mealworms and insect pate. They were successfully released back into the wild together.